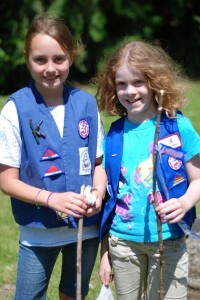 Members of Camp Fire are provided a plethora of resources and curriculum. The Camp Fire curriculum focuses on embodying our core values while focusing on providing youth with meaningful experiences. Group Leaders plan activities based on the interests of youth participants in their group, which is guided by Camp Fire curriculum. One extremely strong component of the Camp Fire curriculum incorporates the importance of activities chosen by the youth participants in the groups. Through seeking input, providing choices and shared leadership roles, youth participants should be the driving force behind the curriculum choices. This program is for preschoolers, ages 3-5. Youth participants in this program will become better prepared for school, will build stronger family bonds, and will start to form healthy habits. This program is for children in Kindergarten through 2nd grade. Youth continue developing good communication skills, start learning how they can make a difference by completing community service projects of their choice, and experiment in the arts and sciences. This program is for children in 3rd through 5th grade. Youth participants continue to build on all the skills and knowledge that they have gained through school and Camp Fire, plus they begin to focus on making goals, breaking the goals into smaller pieces, and working to achieve their goals. They also learn how to work as a team and begin building their leadership skills. This program is designed for youth in middle school (6th through 8th grade). By now youth have developed strong interests in various topics and the Camp Fire curriculum helps youth explore this interest but also introduces them to new things. Youth also begin developing life skills and learn to explore technology safely. This program is for high school age youth (9 through 12th grade). While completing this program youth not only have a chance to earn the Wohelo Award (highest honor in Camp Fire), but they are gaining skills and knowledge that will help them succeed as adults. They learn about budgets, how to recognize healthy and unhealthy relationships, how to apply for jobs, and continue their journey of self-discovery. Camp Fire participants will journey down 5 different trails throughout each program progression. In order to complete a trail, youth must complete certain meeting requirements. Trail To Knowing Me – Youth participants learn about relationships, improve communication skills, gain self-knowledge, and learn how to stay healthy and safe. Trail To Family & Community – Youth participants learn about families and communities, how to work as a team, how to become effective leaders, and how to help out in their homes and communities. Trail To Creativity – This trail stimulates one’s creativity and imagination through activities that involve the visual and preforming arts. Our participants will experiment creating art using various mediums, create music, and participate in the dramatic arts. Trail To The Environment – In this trail, youth participants will understand and appreciate the natural world by participating in activities focused on nature, environmental awareness, and animals. Participants will explore and take hikes, engage in hands-on learning about earth and life sciences, and gain outdoor skills. Trail To The Future – Youth participants will develop numerous mental and physical skills needed for their futures. Participants may play sports and games to teach sharing, teamwork, and good sportsmanship. Children learn to cook, explore the physical sciences, and learn to stay physically fit. As youth participants get older, the objectives throughout each trail cater to their developmental milestones and will progressively encourage youth participants to advance their knowledge and understanding. Group Leaders have access to curriculum guides pertaining to each program level. Each guide is broken down by trail and provides meeting lessons for leaders to then seek input from their group participants. 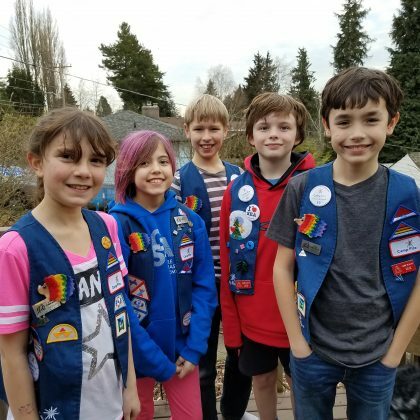 As youth participants continue throughout the program progressions, they will earn emblems, beads, pins and various other recognition items to show the successes they are accomplishing in the Camp Fire program. Such items are displayed on a vest, or sash. 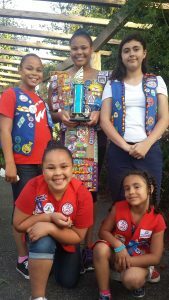 Learn more about Recognition Awards & Uniforms in Camp Fire.